Virtual base class for expanding operators. 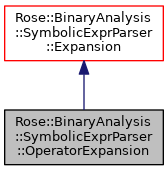 Definition at line 270 of file BinarySymbolicExprParser.h. 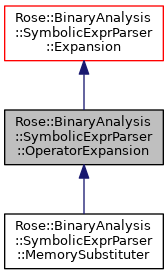 Definition at line 273 of file BinarySymbolicExprParser.h. Operator to expand a list into an expression tree. The width in bits is either the width specified in square brackets for the function symbol, or zero. Functors are all called for each symbol, and the first one to return non-null is the one that's used to generate the symbolic expression.